Inventory is now starting to tighten up even more which is pushing sales and values even higher. June total active listings were down to 18,828 from 19,405 last month. Inventory a year ago was approx 17,855 and our 5 year average is 17,044 homes for sale in June. Sales and demand are both increasing, typically we begin to see a slowdown in July, but there are no signs of that right now. Total sales for June was 8,798 which is an 3.2% increase from a year ago. And sales volume is above our 5 year average of 8,298 sales for the month of June. Median sales price for June was $230,00 which is approx 7.0% better than a year ago. This well above the 5 year average of $192,044 and shows us the radical improvement the market has made over the past 5 years. Average days on market decreased a bit to 74. This is an improvement from a year ago when it was 77. The 5 year average is 77. This is showing us how demand remains strong and values are increasing. The average sold to list price for June was 96.5%, which is higher of 0.2% from the previous month. The 5 year average is 96.9%, so again we are seeing normal trend lines. The housing market in Phoenix is extremely strong in the $300,000 and below price range. $300,000 - $500,000 is fairly neutral and $500,000+ is favoring buyers. Interest rates hit an all time low in July and you can see how it is has pushed demand even higher which is pushing values up. The median price went up 2.2% in one month!! That's rare and not sustainable, but appears likely to continue in the short term. We rarely see a market that favors both sellers and buyers, but that is what we have right now. It's a great time to sell because demand is so strong and inventory is limited. It's a great time to buy because interest rates are the lowest they have ever been. Remember a 1% increase in interest rate affects your buying power by 10%. In other words if you can qualify for a $250,000 price point at 3.5% interest rate today, if rates were to spike to 4.5% you would now qualify for $225,000 price point. Rates have been floating between 3.5% - 4.5% for several years now, and they did spike a whole 1% in 30 days back in 2013, so if you are planning to purchase it makes sense to take advantage of interest rates now. The current average 30-year fixed mortgage rate remained stable at 3.33% on Thursday, Zillow announced. 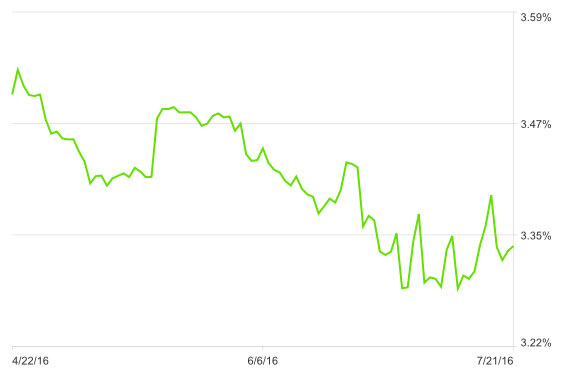 The 30-year fixed mortgage rate on July 21, 2016 is up 1 basis point from the previous week's average rate of 3.32%. Additionally, the current national average 15-year fixed mortgage rate increased 1 basis point from 2.60% to 2.61%. The current national average 5/1 ARM rate is down 2 basis points from 2.73% to 2.71%.